Please welcome author Richard B. Knight! His novel, The Darkness of the Womb, will be sure to catch your interest (and not just because the title is so intriguing). Here’s a little about Richard, his novel, his views on writer’s block, and more! Find more about him on his website and his blog. Description: A pregnant mother journeys inside her unborn child’s subconscious to prevent him from miscarrying himself. Author’s bio: Richard B. Knight (The “B” stands for Brandon) teaches Language Arts during the day and writes fiction at night. He decided that he wanted to be a novelist back in the fourth grade. It was all quite spontaneous. Back then, his teacher asked all of the students what they wanted to be when they grew up, and while many students chose “doctor”, or “lawyer”, or “astronaut”, Richard, wanting to be funny, chose “drag queen garbage man”. It wasn’t until his peers starting reading off their choices that Richard decided that it would probably behoove him to write down another profession. He has stuck with “novelist” ever since. 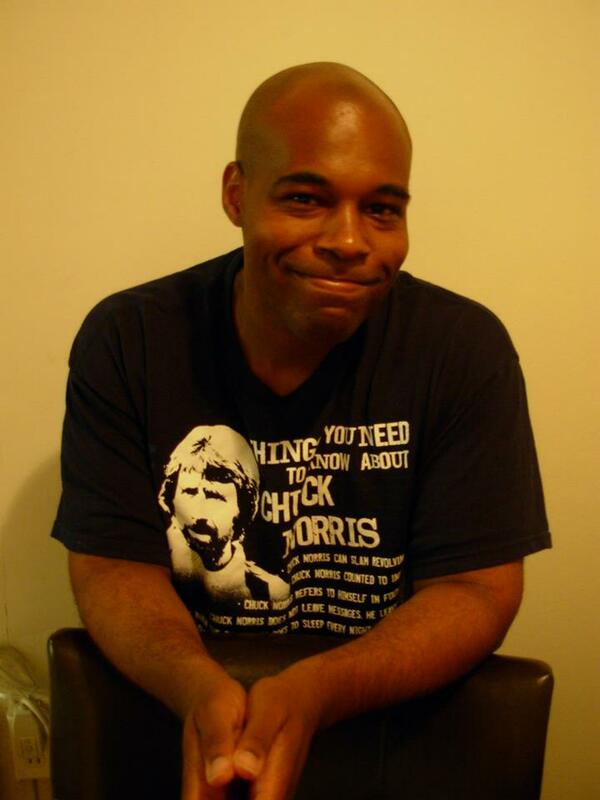 Richard has a love of movies, video games, and comic books, and all three influences come through in his writing. He currently lives in Clifton, New Jersey with his lovely wife, Rona. 1. Who is your favorite author and why? Your favorite work by that author? If you could ask them one question, what would it be? 2. Do you work full-time as an author, or do you wear more than one hat? Tell us about the challenges that accompany your chosen profession(s)? I teach for a living. I wish I wrote for a living. I tried that once and it ended badly. Apparently, it’s important to have health insurance in your life. But being a teacher has affected me greatly, and a lot of the classroom stuff in my first novel, The Darkness of the Womb, actually happened to me. No joke. Any teacher will tell you. If you think teaching is easy, then why don’t you do it? Most of the time, people can’t. That’s why they quit after two or three years. Pansies. 3. Walk us through your writing process–if you have one, that is. What works for you? I just write whatever is on my mind at the time. I like to read at least a full hour before I start writing, and while I read, a part of my brain is thinking about what my next chapter will be about. I don’t plot out anything and I save molding for after I’m done writing. It’s just easier for me that way. 4. Any writer’s block remedies? Stop worrying about what you’re going to write. If you have writer’s block, do something else. Go for a walk or something. Walks always help me. I never feel pressure when I write. Not anymore, anyway. Life is too short for writer’s block. 5. If you could be one character in your book, who would you be and why? I actually am a character in my book, and he’s kind of the hero of the story (I’m glad I’m not vain or anything). The director, Kevin Smith, put himself in his first movie, Clerks, because he wasn’t sure if it would be his last movie or not. I didn’t think my book would be my last, but you never know. If I happened to somehow die before I finish my next book, I wanted to make sure I’d be remembered as the guy who took down a massive centipede in a desert with a machete and a shotgun. That’s a pretty cool way to go out. 6. What inspired you to create your antagonist? Can you tell us about him/her? The antagonist in the book is Lord Imagination, who is a god in the Internal Landscape (Lady Logic is a god, too). I wanted Imagination to be the enemy because the world my story takes place in is the universal mind, and Imagination can be an enemy to so many people, and in so many different ways. To some, Imagination can be extremely generous, and to others, he can be the biggest jerk in the world (Especially to writers who get writer’s block). Like all villains, though, Imagination doesn’t see himself as a villain. He thinks he’s misunderstood and feels he knows what’s best for mankind. Lady Logic disagrees. She’s tired of his bull crap, and in a lot of ways, the story is really the war between Logic and Imagination, and which is more important in life. Both characters forget that they’re equally important to humans. That provides some of the conflict in the story. 7. Leave aspiring authors with some advice. Be yourself. Nobody else sees the world the way you see it, so don’t mimic others in any aspect of your life. Write the book that you want to write. Oh, and stay frosty. 8. What do you want your readers to come away with after reading your book? I just want the reader to have a good time. If they get anything out of it, jawsome (And yes, that’s awesome with a “J”. That was the catchphrase on the show Street Sharks. I used to love that show), but if they don’t, then I at least want them to have enjoyed themselves. That’s all I could ever ask for. 9. Any new releases on the way? What are you working on right now? I’m working on a YA novel about a boy who can control corpses with his mind. He wants to start an undead wrestling league. The story takes place in 1999, and Bill Clinton, Vince McMahon, and the devil himself all make appearances. It’s called A Boy and His Corpse. Thank you so much, Richard, for interviewing! If you guys are interested in Richard’s work, please visit his facebook page and twitter to learn more about him. If you want to take a closer look at his work, visit his Barnes and Noble, Kobo, and his Amazon page!